Eric Holder appeared before the House Oversight and Government Reform Committee today, and received what can charitably be called a hostile reception. He was grilled by Republican members over everything from Fast and Furious–the intended subject of the hearing–to the Marc Rich pardon. I haven’t had time to track down and read the entire transcript of the hearing, but this ABC News account includes extensive quotations of Holder’s colloquies with House members. Rep. Tim Walberg, R-Mich., blasted Holder for his handling of the Marc Rich pardon and for Holder’s decision to reopen a criminal investigation into abuse and torture of terrorism detainees by CIA operatives and interrogators. That is welcome news; left unexplained is why Holder reopened that investigation in the first place, and why it took three years to abandon the harassment of loyal government employees. 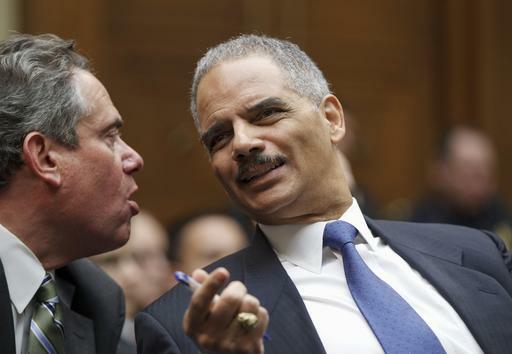 Committee members accused Holder of covering up the facts surrounding the Fast and Furious scandal. This is hardly a frivolous accusation, given that DOJ admittedly supplied false information to the House committee, and has turned over only a tiny fraction of the available documents in response to the committee’s subpoena. In response, Holder defended the doctrine of executive privilege. Executive privilege is like the filibuster: whether it is an outrageous practice or a pillar of our Constitution depends entirely on which party is making use of it. At Commentary, Seth Mandel notes that this is one more in a long series of instances where the Obama administration has acknowledged that Bush and Cheney were right all along. Still, as he points out, you wouldn’t want to hold your breath waiting for Jon Stewart to denounce the Obama administration’s assertions of executive privilege. You know, I mean, really, is that the way in which you want to be seen, you want to be known? You know, I should be held accountable for, certainly, my role in whatever I did or didn’t do in connection with the supervision of Fast and Furious, but I’m attorney general of the United States and I should also be accountable and perhaps even given some credit — imagine that — given some credit for the things that this Justice Department has done under my leadership, whether it deals with national security, revitalized antitrust, revitalized civil rights enforcement effort. And so one has to balance all of these things. I get up every day and try to do the best job that I can. I have great faith in the people who work in the department. And, you know, that kind of question, I think, is, frankly — and again, respectfully — I think that’s beneath a member of Congress. That was among the worst things I think I’ve ever seen in Congress. You took a whole series of statements out of context, with no context. … There is a whole bunch of things that I could say about what you just did, and maybe this is the way you do things, you know, in Idaho or wherever you’re from. But understand something. What I’ve done — I’m proud of the work that I’ve done as attorney general of the United States. And looked at fairly– I think that I’ve done, you know, a pretty good job. Have I been perfect? No. Have I made mistakes? Yes. Do I treat the members of this committee with respect? I always hope that I do. And what you have just done is, if nothing else, disrespectful. And if you don’t like me, that’s one thing, but you should respect the fact that I hold an office that is deserving of respect. And, you know, maybe you’re new to this committee. I don’t know. I don’t know how long you’ve been here. But my hope would be that, you know, we can get beyond that kind of interaction, that kind of treatment of a witness, whether it’s me or somebody else, because I think in some ways what you did was fundamentally unfair, just not right. Eric Holder personifies the thin-skinned arrogance of the Obama administration. For someone who has spent his entire adult life in Washington, his expectations seem weirdly naive. I actually agree with Holder that witnesses who appear before Congressional committees should be treated respectfully–not just government officials, but witnesses in general. Businessmen, for example. But where has Eric Holder been–where has any Democrat been?–when bankers, oil company executives and other private citizens have been hauled before Congressional committees and subjected to outrageously rude and unfair treatment? Far more unfair, an unbiased observer might say, than the grilling Holder got over a mystifyingly stupid and likely ill-intentioned government program that got at least one federal agent and a lot of Mexicans killed. Holder’s outrage is another instance of the “civility” dodge that liberals have opportunistically engaged in over the last year or two. Civility? I’m for it. But it’s a two-way street.